Since its beginnings as a failed pipeline project in the early 2000’s, through to the announcement of a proposed doubling of production capacity earlier this year, Papua New Guinea’s PNG LNG has had a bumpy road to travel. Its past has been chequered by violence, vandalism, natural disaster, and seemingly insurmountable technical hurdles. Here’s the story behind one of the world’s largest, most controversial, and most challenging LNG projects. PNG LNG traces its origins back to a proposal by the Australian company Oil Search Ltd, known as the PNG Gas Project. The idea behind this first project was to bring gas from Papua New Guinea’s southern highlands to consumers in Australia via a 3000km pipeline. Oil Search joined forces with ExxonMobil in 2001, but the project ran into problems. These came to a head when the Australian Gas Light-Petronas Consortium pulled out of laying the Australian section of the pipeline because of concerns over a lack of confirmed customers. Another issue was that gas prices in Eastern Australia had been kept below the market average due to competition with locally produced coal. As prices in Asia and elsewhere in the world rose, it quickly became apparent that shifting focus to LNG would bring better returns. 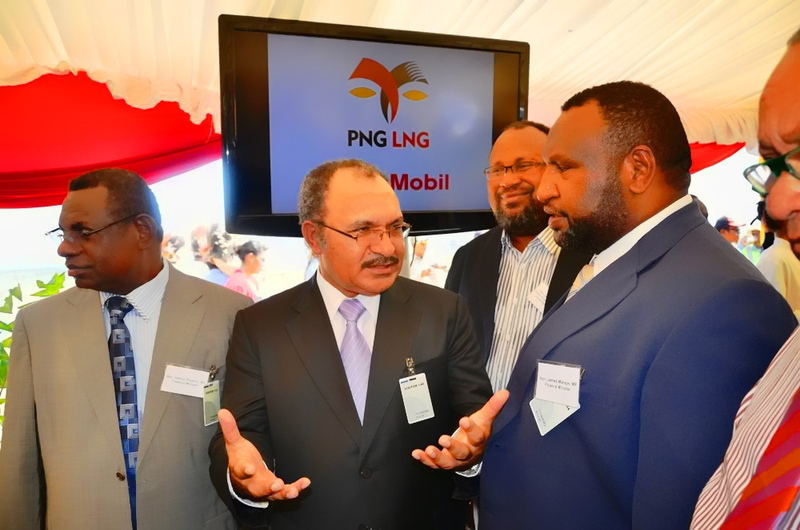 In 2008, an agreement was signed between ExxonMobil, Oil Search, and other partners defining the legal framework under which the PNG LNG project would operate. Sales agreements followed, most notably with the Tokyo Electric Power Company (TEPCO). In 2010, the construction phase of the PNG LNG project officially began. At the outset, Exxon and their partners were aware that PNG LNG would be no straightforward undertaking. The planned sites for the wells to be drilled were situated in rugged, hilly terrain far from roads or ports. Exxon would have to fly in the necessary construction materials and equipment. But flying in such large cargoes would require heavy cargo planes, and a runway able to accommodate them - so Exxon set out to build one. As the site of the new runway, Exxon chose a flat mountaintop in Hela province, close to where the wells would be drilled. 400,00 cubic metres of rock were laid to construct an asphalt runway 3.2 km long. Komo Airfield, as it is called, would be larger than any other in Papua New Guinea, and able to accommodate deliveries from one of the world’s largest cargo aircraft, the Antonov An-124. The next challenge was the wells themselves. With an average depth of over 3600m they are unusually deep, drilled through hard surface limestone, with varying pressure levels at greater depths. Exxon built eight of them in Hides, as well as a gas conditioning plant to separate out condensates (30,000 barrels of condensate are produced by the plant daily, and exported from the Port of Kumul). After processing, the gas needed to be transported 290km over a variety of terrains – including steep slopes up to an altitude of 2100m, swampland, and land covered in thick vegetation – to reach the mouth of the Omati river at sea-level. Construction of the onshore pipeline was completed in March 2014, after four years and over 28 million work hours expended. From the coast, the gas would need to travel a further 407km, to reach the site of the LNG plant near Papua New Guinea’s Capital, Port Moresby. Fully 45 vessels were involved in laying the offshore pipeline, which was completed ahead of the onshore section in February 2013. Exxon also built two massive 160,000 cubic metre LNG storage tanks, and a marine loading terminal able to accommodate tankers with a capacity of up to 215,000 cubic metres. Despite the difficulties presented by terrain, and the need to train a local workforce (10,000 Papua New Guineans were trained during the construction phase of PNG LNG), the project was completed ahead of schedule. Production began in April 2014, with the first cargo shipped to TEPCO the following month. By completing the construction of PNG LNG in such a timely fashion, ExxonMobil had confounded the project’s naysayers. But the company’s ruthless approach to meeting its construction targets was not without consequences. On January 24th, 2012, a mountainside above a quarry in Hela province collapsed. The resulting landslide killed at least 25 people, mostly local villagers, including women and children. The quarry had been dug by ExxonMobil’s sub-contractors to provide rock and gravel for the PNG LNG project’s upstream operations. Immediately, questions were raised about ExxonMobil’s role in the disaster. A report issued a year before the landslide by the independent consultants D’Appolonia had accused ExxonMobil of circumventing “correct procedures in the interest of schedule”. Although the Papua New Guinea government absolved ExxonMobil of any responsibility, the disaster seemed like a warning come true. Two years later, the event became the subject of the short documentary “When We Were Hela”, created by filmmakers Ian T. Shearn and Oliver Pollet. The film accused ExxonMobil of ignoring warnings from engineers that the quarry posed a risk of collapse. It also pointed towards backhanded measures in ExxonMobil’s dealing with the populace, including bribery and arming local law enforcement. ExxonMobil maintain that their operations did not play a role in the disaster, citing a report by the PNG National Disaster Centre which concludes that the landslide was the result of heavy rainfall. They also deny providing weapons to local law enforcement. The Tumbi Quarry landslide is by no means the only bone of contention between ExxonMobil and the local populace. The PNG LNG project has been plagued by security threats, including tribal violence, and opposition from local landowners who feel they have not been fully compensated by the Papua New Guinea government. Last November, unrest led to staff evacuations and unscheduled work stoppages. In June, there were reports of vandalism to a new pipeline Exxon is constructing between the Angore gas field and the Hides processing plant. And violence flared up again in July, when disputes led local landowners to set fire to construction equipment and blockade wellhead sites. Some of the disaffection around the PNG LNG project stems from the perceived disparity between the promises of economic revitalisation made by ExxonMobil, and the economic realities. These were made explicit in a withering study by the Jubilee Australia Research Centre in April. According to the study, PNG LNG had fallen well short of its promises. Exxon had predicted that Papua New Guinea’s economy would double in size, but it increased by only 10%. Household incomes were projected to rise by 84%, but fell by 6%. Employment was predicted to rise by 42%, but fell by 27%. The study lays the blame for this shortfall on Papua New Guinea’s huge rise in public spending, undertaken in expectation of tax revenues which never materialised. As if bad publicity was not enough to contend with, in February this year PNG LNG was forced to recover from a destructive 7.5 magnitude earthquake, which halted output for two months and spiked Asian spot LNG prices. The earthquake caused extensive damage to the Kumu airfield, and minor damage to the Hides gas conditioning plant, both of which were close to the epicentre. Exxon were forced to evacuate around 300 non-essential personnel from the area, and predicted a halt in production lasting eight weeks. Speaking at an industry event shortly after the earthquake, PNG LNG’s Managing Director Andrew Barry underlined ExxonMobil’s commitment to the project. "The country is well placed to capture a new round of investment opportunities to drive further growth. For me, the earthquake has reinforced the need for all stakeholders to continue to work together," he said. Production resumed ahead of schedule in April. Earthquakes, vandalism and negative press have not dinted ExxonMobil’s appetite for investment in Papua New Guinea. Earlier this year, the company announced its plans to expand LNG production from the facility through the addition of three extra processing trains. Two of these will receive gas from the Elk-Antelope fields, owned by the French supermajor Total. The third train will be the first to liquefy natural gas from Exxon’s P’nyang field, estimated to contain 4.36 trillion cubic feet of gas. If the expansion goes ahead, it will bring the total output from PNG LNG to 16 million tonnes of liquefied natural gas per annum (ahead of Australia’s massive Gorgon LNG project, which has a combined capacity of 15 mtpa across its three trains). The cost of the expansion is estimated at a relatively modest $13 billion, with a final investment decision expected in 2019. Production from the three new trains could begin as soon as 2023. Exxon Mobil is also looking to start extracting gas from the Muruk gas field, close to the Hides gas field which currently supplies the PNG LNG project.